Proud to have the smallest environmental footprint of all North American auto plants. 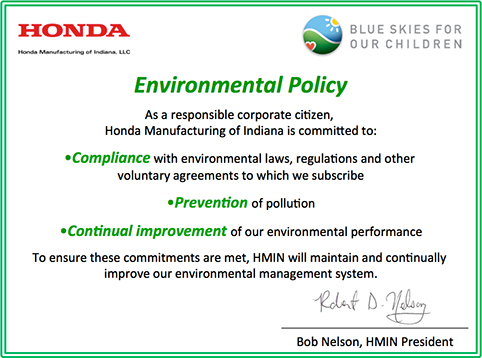 At Honda Manufacturing of Indiana, we care about our environment, which is why we work hard within the facility and in our community to preserve it. Although our facility stretches across 1,600 acres, it was designed to have the smallest environmental footprint of all North American auto plants and is the third North American Honda plant to be a “zero waste-to-landfill” facility. By staying true to our environment, Honda is able to improve on natural resource reduction in many aspects of the plant, including reducing both natural gas and electricity usage to decrease CO2 emissions; installing equipment that is more efficient, such as smaller paint booths to recycle air back into the plant; monitoring and adjusting the plant temperature; ensuring all departments turn off lights during breaks, lunch and end of shift; and turning on and shutting down equipment at the beginning and end of shifts. Honda Manufacturing of Indiana has received LEED Certification for its Welcome Center. LEED stands for Leadership in Energy and Environmental Design. LEED Certification is awarded by the Green Building Certification Institute (GBCI), which recognizes excellence in green building practice and performance globally through its third-party certification services. The Welcome Center was evaluated in six categories: Sustainable Site, Water Efficiency, Energy and Atmosphere, Materials and Resources, Indoor Environmental Quality and Innovative Design. Honda also installed 12 Honda Soltec solar panels on-site to help reduce total energy usage. This is our first endeavor into solar power, and shows Honda’s commitment to the environment and support of earth-friendly products. Seven lakes surround the facility acting as natural aquatic filters, protecting nearby farmland from sediments associated with runoff. HMIN also rehabilitated a vital floodplain with a new creek side forest growth that will enhance biodiversity, including reforesting more than 6,000 native plants. Honda is also leasing 350 acres of its property for farming purposes. HMIN is a benchmark site for other North American Honda manufacturing facilities when it comes to the environment and will continue our commitment to the improvement and efficiency of our facility. 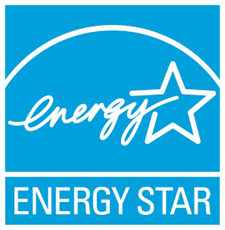 For the third time, HMIN earned the EPA's ENERGY STAR certification. The Indiana plant was one of three Honda plants to receive this certification for 2013. This certification signifies that HMIN performs in the top 25 percent of similar facilities nationwide for energy efficiency.